Our home is a reflection of our personality. Throughout Boroondara’s neighbourhoods, there are myriad personalities expressed in an extensive range of architectural styles from our past and present. It is important to celebrate our rich architectural assets as they greatly shape the character of our City. We have chosen to do this by introducing a series of stories showcasing exceptional architect-designed houses within Boroondara in celebration of the many personalities that make up the City we love. Our guest writer, Stephen Crafti, is one of Australia’s most prominent and prolific architecture and design writers. He will interview the architects and owners of the houses and give us a glimpse of their journey to preserve, renovate and rework a great period home, or build a brand new home in Boroondara. 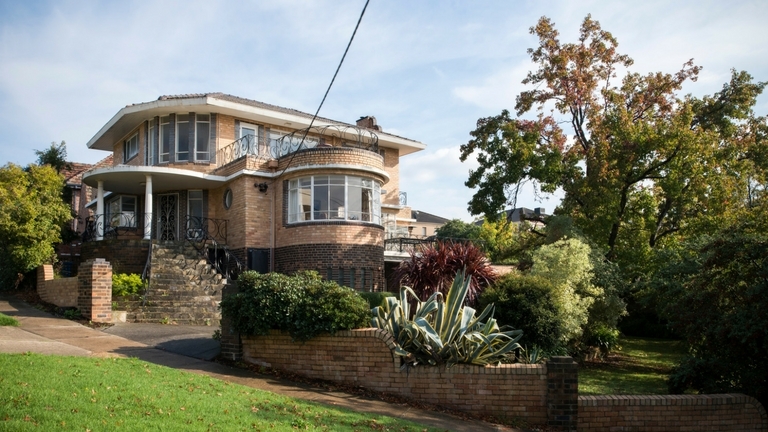 There are only a handful of three-level waterfall-style art-deco homes in Boroondara. The owners of this cream and brown brick banded house in North Balwyn, were fortunate to purchase one of these homes nine years ago. “We only had ‘eyes’ for art deco and we were prepared to live in the right house even if that meant spending up to an hour driving to and from the city,” says Kate Gorman, an actor and film director, who lives here with her partner Matthew, their three children and two cats. Gorman and Matthew had previously lived in a triple-fronted cream brick Waterfall-style house in Ashburton. While the charm was there, this house only had two bedrooms. “My grandfather made furniture in the 1930s and as a child I grew up in a Californian bungalow with highly decorative ceilings. In my mind’s eye, I can still make out the rich patterns of the ceiling mouldings,” says Gorman. The couple searched for a couple of years and while they were overseas, Gorman’s mother notified them that their current house had just been listed for sale. “I think I must have attended every open-for-inspection on my return to Melbourne. Matthew suggested I wait outside rather than showing my enthusiasm to the agent and others inspecting the house,” says Gorman, who walked away with the keys on auction day. Originally built in 1945, the house is pure fantasy. Curvaceous balustrades, with wave-like motifs, increase the adrenalin rush as one climbs the stone stairs, as do the many sea bearing motifs, such as the porthole windows and etched ship scenes which present themselves around the front door. As well as having four bedrooms (unusual for a home built at this time given the war had just ended), a separate living and dining area and wrap-around-balconies, the house also included maid’s quarters and even a ballroom at basement level. However, while the house and triangular-shaped parcel of land quickened the couple’s heartbeat, it was the highly decorative ceilings, wall sconces and mouldings that sold it to them. “I walked into the formal lounge and the first thing I noticed was the lily of the valley lighting sconces carved into the wall. Just look at these ceilings,” adds Gorman, pointing out the wave-like ‘encrustations’ that feature in the ceiling. The highly decorative ceiling in the ballroom still featured its original colour scheme of pale salmon pink and grey with touches of gold. As the North Balwyn house had previously been in the same family for 55 years (not the original owners), very little had been altered. Apart from the need to rewire and re-plumb, the kitchen had been altered in the 1970s, as had one bathroom. Gorman worked closely with architect Cagla Akguner-Taylor, director of CHEG Architecture, who also shared the couple’s love of art deco. 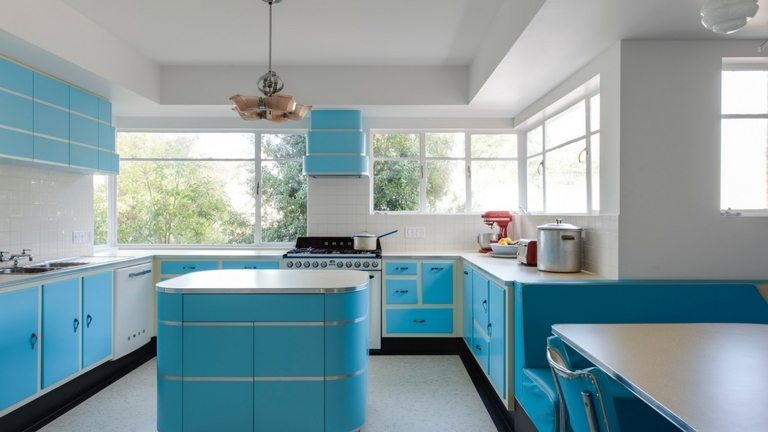 While the new kitchen, with its sky blue-painted cupboards, cream-tile splashbacks and nifty breakfast nook appears original, it is new, as seen by the stepped waterfall-style rangehood. The steel sunrise pattern screen, separating the kitchen from the passage, is actually a steel gate from the 1930s. One of the showpiece rooms is the bathroom (previously forming part of the maid’s quarters). Appearing in original condition, it has, in fact, been meticulously pieced together, starting with the impressive three etched glass panels of a mermaid and fish, originally designed for a large house in Sydney. 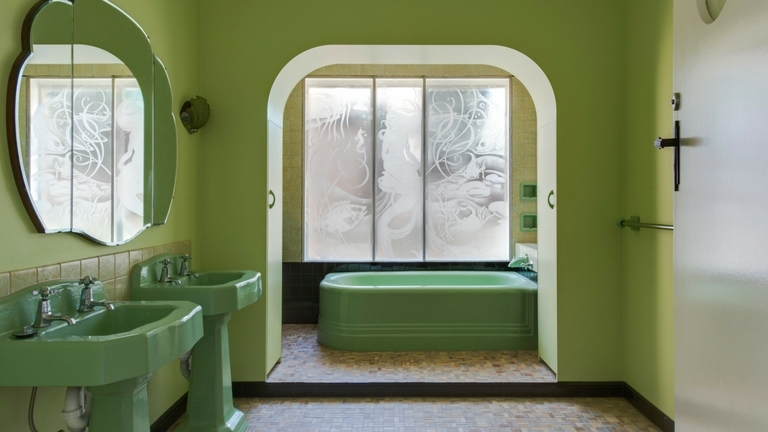 Other elements, such as the twin vanity 1930s basins, were also discovered on the internet, as was the prized mint-green enamelled bath. Tiles from the 1930s were also sourced and rejuvenated, as was tapware. “I love it when people walk into this bathroom and say how fortunate we are to have such an original bathroom, in mint condition,” says Gorman. Where the home’s ‘footprint’ has been increased, this has been done sympathetically using cream bricks and steel-framed windows. Although Gorman wasn’t able to find original photos of the house, she delights in hearing stories about it from older members of the community. “Apparently, the ballroom doubled as a function centre and residence in the late 1940s. I have also been told there was a quasi public swimming pool in the front garden that neighbours sometimes used,” says Gorman, who was fascinated to discover a number of pool tiles that were unearthed soon after she moved in. While the house isn’t a ‘museum’, there’s a wonderful array of furniture, objects and artefacts that have been slowly collected over a lifetime. Club-style 1930s furniture, stylised and colourful decorative ceramics, along with both original and newly sourced 1930s light fittings appear in each room. To ensure the ceilings remain a focal point, wall sconces rather than pendant lights are used. 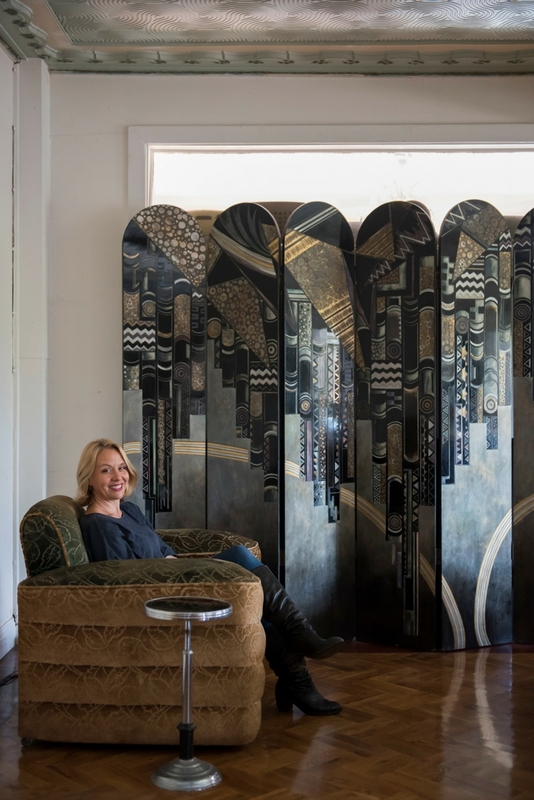 One of Gorman’s most prized possessions is a luscious and highly decorative 1930s screen that she found in an antique store in Bath, England. For Gorman and her family, the house isn’t a museum, but a continual reminder of great 1930s style. “I feel like we’re custodians of this house. It is certainly an important part of the City’s heritage. It just happens to be from its more recent past,” she adds. Kate Gorman would greatly appreciate seeing any original photos of the house that may still be in neighbours’ photo albums. She can be contacted by emailing Kate Gorman.